Population: Less than 1000. Mostly fishermen. Landscape: Semi-arid and flat. Some sand beaches but murky water. History: In 1528, the pearl beds of Coche were developed by the Spanish, who used native slaves to harvest the oysters. The pearls produced incredible wealth for a while, but at a great cost. The Spanish slave masters used whips to drive the divers, and gave them very scanty rations. The open sores from the whips did not receive treatment, and the bleeding attracted many sharks. As the pearl beds began to decline, the sharks became so prevalent that continued diving was almost impossible. Salt was also discovered on Coche, and was also harvested unmercifully. 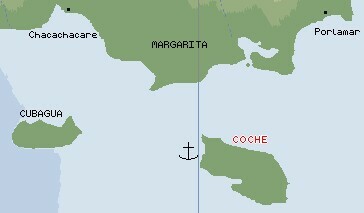 Between salt and pearls, Coche was a treasure trove of natural resources to the Spaniards. In 1529, Coche was producing about 820 pounds of pearls EACH MONTH! This was an astounding amount from the rather small and arid island. On Christmas Day of 1541, an earthquake and tsunami obliterated the settlement on Coche (it also damaged other places in the area) and put an end to the use of the island by the Spanish. Although pearl exploitation did eventually restart on Coche, it took three and a half centuries. Another half century later (1944,) special legislation enforcing conservation of the pearl beds went into effect, and no pearl fishing has been permitted since 1962. Coche passed through the Venezuelan revolution essentially untouched. The only point of note is that on April 25, 1815, the Spanish flagship carrying the General in command of the 15,000 troops sent to quell the insurrection, sank in Coche's waters without warning and still rests on the bottom. A small fishing village and resort are currently located on Coche, which receives its water from a branch of the pipeline that supplies Margarita. (Amanda age 13) I'm not sure if we would have gone to Coche, south of Margarita, if all of our cruising-friends hadn't been there. The water was murky, day-charter boats came in every day about five at a time, and there's nothing on the island except for a resort and scrubby land. 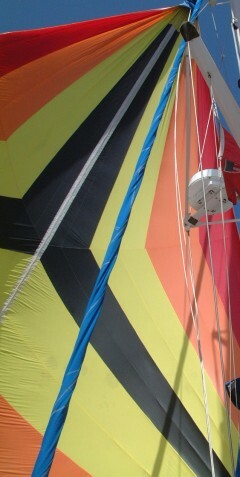 As it was, when we came down from Los Testigos, flying our spinnaker, all our friends with kids were there. It was a bit late in the day, but we went there anyway, enjoying the thought of a cool swim in a (non-salty!) pool. See, the resort there had a swimming pool, and they nicely let cruising boats use it, as long as we bought drinks from them. At 600 Bolivars a soda (roughly 40 US cents), we didn't find it a bad idea at all. I spent many an afternoon in there, swimming with my friends. One of the fun things we did was have several bonfires on the beach. Well, they were supposed to be bonfires -- they turned out more like small campfires. But that's not the point. The first one we had was with a bunch of other cruising boats, most of which had kids. So all the adults sat around and talked, while all of us kids played beach soccer. For those of you who haven't played it before, it is very sandy, and possibly painful. Painful, because no one has shoes or shin-pads, and sandy because whenever someone kicks the ball too hard, it goes in the water, and then it picks up a lot of sand, and that sand sticks to you whenever the ball hits you. Quite a fun game, and I enjoyed it a lot because I hadn't played soccer in about ten months. 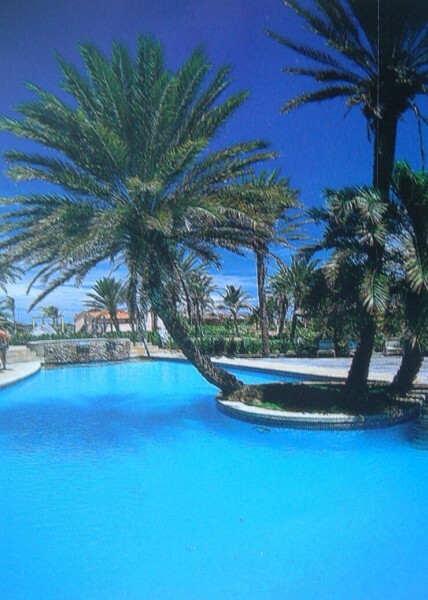 Coche Hotel pool. Rum punches were $.40 each. (Chris age 16) The only things that really made Coche worth visiting were all the other cruisers there (including many kids) and the thought of a real, freshwater swimming pool. When we arrived, we had no local currency, but the family on Pelican loaned us 20,000 Bs, (Thanks guys!) which is enough for a week or two there. Sadly, Coche's water is murky, it has essentially no supplies for yachts, and it doesn't offer many sights. When most of the cruising boats started to pick up and head over to Porlamar, Margarita, we went along. (Sue) We had a glorious sail to Coche from Los Testigos. We would normally have stopped in Margarita, but we had several friends we wanted to meet in Coche. Since this extended the sail to 65 miles, we got an early start, leaving with 5 other boats (& passing them all). For the first several hours, we had a screaming broad reach, with the wind off the beam at 20 knots. Then the wind backed and lightened a bit so we set our spinnaker (the "'Chute"), which we flew all the way to the Coche buoy. Ditto on what Chris says -- though I would add that the water off Coche, while not clear, was pretty flat and had fun with the sailing dinghy and windsurfer. It sure felt decadent to sit around a lovely resort swimming pool drinking rum punches (40 cents) and chatting with friends! We were there with Pelican, Scud, Ludmilla, and Golden Sovereign -- all with teenagers! Cool! English was the common language for the Swiss, American, and French kids. (Jon) So, you might ask, if the hotel was so nice to yachties, why didn't we go back? Good question. It delves into a part of cruising we don't talk about much -- Safety. A couple of weeks after we got back from Mérida, 5 armed thugs in a piñero boarded a US cruising boat anchored in Coche. They made a pretense of stealing the gear on board, but in fact nothing that they took had any resale value. The net result was that the interior was badly trashed, while the couple owning the boat were held at gunpoint. (They sell a nasty sawed off shotgun here for about $150). When the thugs left, they cut the starter cord of the dinghy to prevent anyone following, but at the last moment, the guy who had been advocating shooting the couple the whole time turned and shot the husband in the knee. We have a pretty good communications net down here for this sort of thing. At 8:15 every morning, Melodye on 2nd Millennium runs a "safety & security" net, and most cruisers listen in. So the next morning, most cruisers in the Caribbean knew of the shooting, and since then, very few boats go back to Coche. The thugs are still at large, and it doesn't seem like much is being done to bring them to justice. So what happened to the victims? Cruising friends immediately went to Coche (only 15 miles from Porlamar) and helped bring the boat back. The husband was taken to the hospital where he was stabilized and initial repairs were made. Once he could leave the hospital, cruising friends helped them take the boat to Trinidad, where the hospital facilities were believed to be better. One sad thing Sue & I have noticed is that there is much more theft & violence towards the yachts than there was in the 1980s, all up and down these islands. Mostly these are thefts of dinghies &/or outboards, or even just fishing gear left on deck, but we never used to see anything like this in the 80's. This past year Porlamar was especially bad for thefts of outboards, and anyone who didn't lift their dinghy (or motor) completely out of the water at night risked losing it. The local Guardia seems much more concerned that everyone's paperwork is satisfactory than personal safety. The thieves were averaging about an outboard every week. In a strange twist, the very first night after her husband was shot in Coche, when the wife was alone on her boat, someone climbed on board in Porlamar, at 3:30am. She screamed into the radio (we'd been keeping the VHF on 24 hours just for this) and about a dozen dinghies converged on her boat. The thief jumped and swam for it, but he was quickly caught and delivered to the Guardia (who were asleep...). We were anchored fairly close, and heard his screams for several more hours, but we had no more thefts in Porlamar for several months. Coche had another shooting incident just before Christmas, but the would-be thieves were scared off before they got inside the boat. Unfortunately they got a shot off at the husband though we don't know how serious his injuries were. It is believed these thugs come from the western end of the Araya Peninsula, just south of Coche. This area is renowned for it's nastiness, almost as though the old pirate hang-out has left behind pirate descendents.